Spring has sprung and the flowers are blooming! At least the lilacs are finally coming out! I love the colours found in nature and this colour combo of lilac, green and blue is going to show up soon in a quilt! Last quilt guild meeting, I got my next tins to work on. It is supposed to work out that we each get one tin per month, but with a few guild meetings cancelled due to weather and quilters being away for one reason or another, I have 3 more to work on! 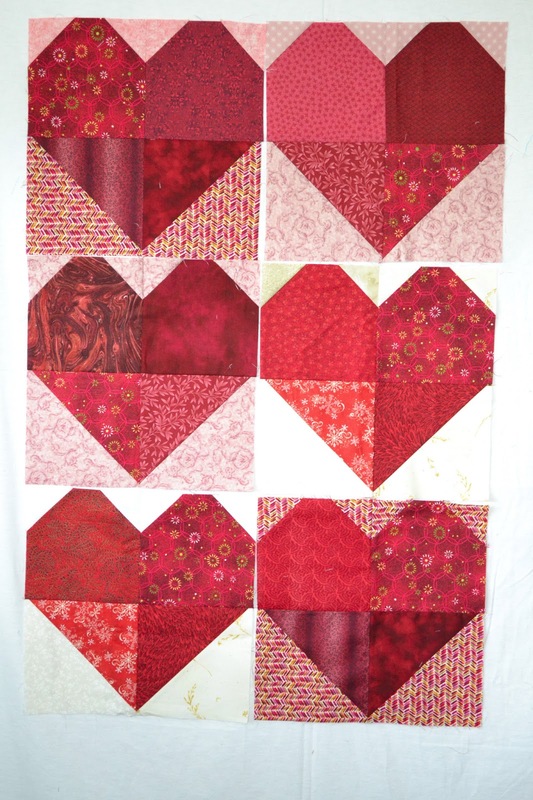 This tin had a strip of red print fabric and a pattern for these beautiful hearts! This one below is my block - there were some leftover pieces left that I used for the bottom of my heart, I used the fabric provided for the top left and my own fabric for the top right and the little triangles at the top. Fast and easy! Red Heart Quilt Block - Tinner's challenge! All 6 blocks so far! 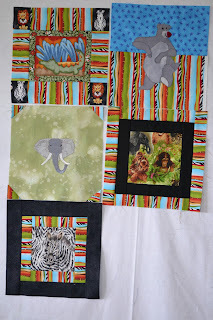 The next tin had a piece of wild green, orange and blue stripe and a theme of jungle! No patterns included this time! I have some zebra fabric I've had for quite some time and I fussy cut it so there was one zebra face in the center, added a couple borders and finished this block. 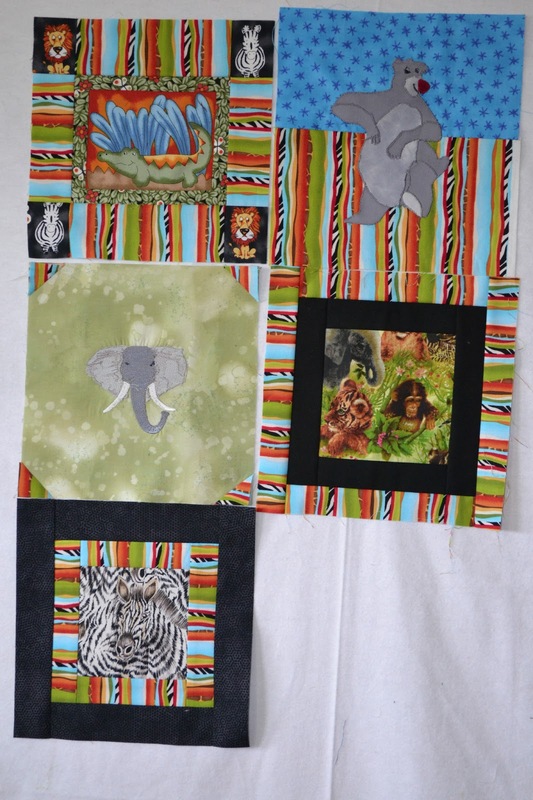 Jungle theme blocks so far. And the last thing I've been working on this week is a set of blocks that were donated to the guild at one time. I've added a lime green batik for sashing and borders and it's now ready for quilting. I'm still not sure if I will be leaving the log cabin blocks in the middle (on the left and right) as they are or if I'll add an applique or something on them. They just seem a bit too pale when everything is all put together. I'm thinking a heart or flower would just add a bit of colour there. This quilt will eventually be part of our charity quilts when it is finished. Your guild's tinner's challenge sounds really interesting. How is it organized? Loving those heart blocks! Hope that answers your question about how it's organized! I still don't know how it will be decided who goes home with what tin, but stay tuned and I'll let you know when I know! LOL! Love this tin challenge. Everyone's is so different! Really like the striped fabric with animal theme! what fun! The tinner's challenge is interesting.